I don't know about you, but when I make it to the end of January, I start seeing warmer days ahead. That may be purely psychological as the ground is rock-solid-frozen, the lake waters covered with at least ten inches of ice [or so I was told when I walked with trepidation across last weekend], and there's snow as far as the eye can see! Nonetheless, the days have noticeably lengthened and the sunlight has a 'kickier' attitude to it. So there! From a design, fashion and carpet style inspiration perspective, I have several gems for you! Two resources definitely worth checking out: Design Reviews From The Floor Up ~ Surroundings and Sensational Color For Your Home about what my friend Kate Smith has created around color. I'm delighted that my friend and colleague, Greer Leisz, has decided to meld her love of shoes with her passion for carpet. Check out Greer's Carpet Fashion Underfoot: Urban Links Carpet Style and Greer's Carpet Fashion Underfoot: Touch of Heaven Carpet Style. I hope it makes you want to check out what's in your closet and how it matches up with what's on your floor. And, then, there's dreamy Inspiring Carpet Styles from Fabrica. Ahhhhh. I hope you enjoyed the Inauguration as much as I did. Here's how it moved me from a carpet perspective: Carpet & The Obama Presidency - Part I, Carpet and the Obama Presidency Part II and Obama Inauguration Reinvents Red Carpet. If you make it to Montana, be sure to check out a carpet exhibit that will take you places: In The News: Magic Carpets Exhibit, Paris Gibson Square Museum, Montana. And, on a practical, but very useful note, check out Annette's Carpet Corner: Claim & Warranty Reference Information. Thank you for reading. Go SuperBowl XLIII, have a wonderful February, and may the Groundhog see something of interest! This week's guest for Flooring The Consumer's Social Media Series: Bridging New & Old is Laurence Borel. Originally from Lyon, France, social media strategist Laurence Borel [a.k.a. Lolly] is London based - since 2000 - although she's NYC bound before long [her first short visit is scheduled for the first week in April]. When I first 'met' her in late 2006, Lolly was a qualitative researcher for GfK NOP, and seemed as comfortable conducting research in Italy as in France or London. 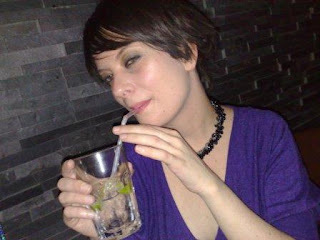 Her blog, Blog Till You Drop [launched in August of 2006 and a top UK marketing blog], offered me wonderful perspectives on French advertising as well as a taste for how all of these social platforms were exploding and being used outside North America. It still does - and more! From a traditional role "delving deep into the consumer psyche in order to shape distinctive brand behaviour which truly strikes a chord with diverse consumers" to social media strategist who recently led a discussion at Media Camp London about how social media applies to big brands and companies, Lolly has an unique perspective on bridging new & old! Lolly also authors a travel and arts blog, Cosmopolitan... with a zest of lemon. You can find her on Twitter @blogtillyoudrop. C.B. : Lolly, tell us how and why you got involved in social media. Lolly: Blogging really started to emerge as a powerful marketing tool in 2006 in the UK and being a geek, I wanted to explore possibilities with this new medium. Things really took off when I began blogging 2.5 years ago - I wasn't 100% happy in my traditional marketing role and thought a blog could potentially help me enhance my career. Although it started as a hobby I quickly became hooked and started experimenting with dozens of different websites. I landed a role earlier this year as a Social Media Strategist, so yes Social Media does work when it comes to career prospects and I have never been happier - my hobby is now my profession and I can usually be found at various networking events in London. I originally started blogging about Marketing and Advertising, but I now tend to focus on Social Media and Digital Marketing. I think asking questions at the end of posts works really well as it motivates my readers to leave comments, express their opinions and have a conversation! I have also learnt about the importance of tagging with the right key-words, and I've picked up quite a few tips in terms of SEO over the years! Lolly: I love the endless possibilities that social media brings - meeting and chatting with people you would never have otherwise met (such as yourself, C.B.!). The power of the community is amazing. I love Social Media because it is both a relationship & community building tool as well as an amazing conversational platform. Advertising was traditionally about pushing one-way messages to consumers whereas Social Media is all about having two-way conversations and empowering consumers. This clearly help companies build a strong relationship with their customers, and consumers on the other hand, now have a medium to express their opinions. Lolly: Social Media is the cool thing to do and many brands want a piece of the cake, even though some of them should stay away from this double-chocolate pudding! I witnessed a couple of very bad Social Media campaigns this year, which are potentially damaging to the industry. The aim of Social Media is to influence the decision-making process and it is something PR practitioners should bear in mind. Social Media is cheaper and arguably more powerful than traditional marketing but it should be handled with care! My other pet hate at the moment are list of influential Twitter users - I simply don't see the point of these! CB: What 5 suggestions do you have for companies to implement so they can more effectively bridge old media with new media and connect with end users? Lolly: First - Listen - what are people saying about your brand? If they are saying something negative about you, engage with them and try to turn this 'threat' into an opportunity! There are plenty of free tools out there to monitor conversations such as Google Alerts, Twitter Search or Tweetbeep but to name a few. Once you've started listening, follow the 4 Is of Social Media Marketing from Danny Brown! "Identify - There are so many different social media tools and applications that it can often be like trying to work your way around a maze. So many different turns to take, easy to get lost with all the options available - which is why it's important to take the time to identify what will work for you. Decide what you want from social media and then use the appropriate tools." "Identity - Having an easily identifiable brand is key for anyone both online and off. Although this is usually applicable to business, personal branding offers an invaluable way of building a reputation as someone to go to for a certain niche. So your identity should be the same across whatever platforms you use - from bio, to profile, to picture, to logo - keeping the same identity across social media platforms will help people remember you more easily." "Invest - There's an old saying that says, "You get out of it what you put into it." While this can be used for most topics, it's particularly true of social media. It's not something you can dip into now and again - it changes too fast for that. Instead, to really see the fruits of your labour, you need to invest time into it. Social media is all about building relationships - and just like relationships in real life, the best ones take time to foster." "Interact - It may seem an obvious thing to say, but there are only two words in social media and one of them is social. Instead of simply broadcasting yourself, interact with the community and actively take part in social media. Read and comment on blogs, both inside and outside your niche; converse on Twitter, share helpful news with people instead of keeping it to yourself for your own benefit.... "
C.B. : Any other thoughts to share about the effectiveness of social media in forging stronger relations with customers? What about in Europe? My best advice is to listen, engage and most importantly be human and have fun! Comments? Reactions? I love that Lolly has brought up the "4 Is of Social Media Marketing." Would you add to that list? What about from an international perspective? Do Lolly's comments bring to mind specific watch outs or unusual benefits in bridging new & old? museum art glass exhibit originally uploaded by Campbellism. Here's a new way to think about your store experience and the role you play for customers: be a retail curator. A museum curator edits what will be on view during an exhibit. S/he selects how and what to display to express a coherent story. Instead of making visitors walk through the equivalent of a warehouse - where everything is stored, some visible, some not, and most inaccessible - the curator creates an environment that tells a relevant story without overwhelming the visitor showing only a subset of the total items available often on a rotating basis. This advice comes from Booz & Co. partner Karla Martin in a Marketing Daily MediaPost News interview titled "Sales Down? Time to Dial Down the SKUs" where she also touches on "smart allocation -- stores devoting more space to what consumers want, and limiting the offerings that simply get in their way." As a shopper overwhelmed with too much product choice - and a lot of it lousy at best - I applaud the desire to address "widespread consumer frustration out there, with many shoppers feeling there are too many choices, presented in a way that's needlessly complicated." Max Kalehoff recommends in AttentionMax that we "Maximize Purpose!" Cleanse, rebalance and declutter. Be a curator, then, and address the Paradox of Choice! Refocus your product so what you offer is relevant to customers. Make it simpler for your customers to understand what value you offer them. As you curate, though, think hard on "less, b ut better" product. That, to me, is where the opportunity lies. Consider what Christian Davies in Retail Design Diva has to say: "Imagine a retail future that is founded on this idea. A future that eschews the disposable in favor of things that can actually last and where consumerism flourishes against a backdrop of responsibility. A future where the American shopper will pay a fair price for these better quality goods, but also where our pocketbooks will be liberated as we finally break our addiction to cheap junk." This is something echoed in boston.com's "Retailers overhaul business as consumers pull back." Consumers aren't looking for disposable items anymore. They have new standards as they question what represents true value. And, in "Lessons Learned And the Damage Done" HFN states that "Good Product Still Overcomes Bad Times." As curator then, you have the opportunity to redefine your store experience, to declutter, to refocus your product story, to refind your purpose and recreate relevance for your customers in a way that sets you apart from the sea of frustrating and meaningless choices out there. There's no greater honor than to be showcased as a case study by someone whose blog you admire! Susan Abbott has done me that honor by profiling Flooring The Consumer on Customer Experience Crossroads in no less than three segments. 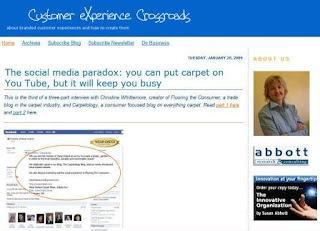 + The social media paradox: you can put carpet on You Tube, but it will keep you busy. If you have the chance, I'd love for you to read through these posts. Susan has done a masterful job telling the Flooring The Consumer story, weaving insightful commentary in with my responses and descriptions. As I read through her posts, I found myself stepping back and considering all of this in a new light. And appreciating anew what you've helped me create. Let me know what jumps out. Are there ideas that you might apply to your business? Are there other approaches I should experiment with this year? What a way to start out 2009! Thank you, Susan. P.S. : Susan has also made this case study the subject of her Customer Crossroads Insights Newsletter from Abbott Research + Consulting. This week's guest for Flooring The Consumer's Social Media Series: Bridging New & Old is Lewis Green. You don't need to meet Lewis Green in person to realize that he cares deeply and doesn't mess around. It certainly comes through on his blog, BizSolutionsPlus, and in any interactions you have with him. The founder and managing principal of L&G Business Solutions, a marketing and communications firm whose motto is "we grow business," Lewis believes deeply in values like integrity and service to deliver results. ROI is something he regularly addresses. All of this must come from his 8 years in the Air Force. Or perhaps from being an 'accidental writer' as he describes in Diva Marketing's Blogger Stories: Lewis Green. Or maybe with having successfully reinvented himself multiple times as travel writer, editor, corporate management and entrepreneur.... Then, again, there's his recently published 5th book How to Grow a Business by Putting People First (AKA Lead With Your Heart) which discusses "how to bridge the gap between old and new and how to integrate media tools to create a dialogue that will engage people." You can also find Lewis at Online Marketing for Marketers and Marketing Profs Daily Fix. A fellow contributor to The Age of Conversation 2 - Why Don't They Get It?, his chapter is titled "What Does the Future Hold for Business Conversations?" The ending shouldn't surprise you given what you now know about him: "Real corporate value, real efficiencies, and real ideas that will affect the bottom line -- that is what businesses will need." CB: Lewis, how/why did you get involved in social media? Lewis: After moving from Seattle to Connecticut in 2003, I wanted to re-establish my company, L&G Business Solutions. With no professional network to tap in the Northeast, I figured the best way to promote my marketing and consulting business would be a blog. I launched the blog in 2005, with a goal of attracting customers to my business. Not surprisingly, I generated little traffic and few business leads. Instead of giving up, however, I took the time to study social media, then implemented a detailed strategy for attracting and maintaining a solid readership base. As a result, I turned my blog into a major source of lead generation, triggering a 40% increase in my client base in 2007. That was the ROI. However, along the way I learned about the value of a blog. My community of peers and virtual friends stretches around the world. And I have had the fortune to meet in person more than a few of these friends. The blog has both been profitable and a happy and mostly warm experience. The value of meeting interesting and smart people, learning from them and appreciating their lives would have made my blogging a worthwhile experience even had there been no ROI; however, without ROI I would not have achieved my original and continuing goal to use it as a lead generation and marketing/communications tactic. Lewis: Social media and social networking are hard work. On average, I write four to five posts a week for my blogging, including contributing to Marketing Profs Daily Fix. In addition, I visit LinkedIn, Facebook and Plaxo Pulse several times a week and spend some time on Twitter every day. And while valuable time is directed to these areas and writing is never easy, even for an author and a former journalist and free-lance writer, the work is rewarding and enjoyable. Lewis: Social media never causes me any dislikes but I am frustrated by those who see these tools as something special for the business world. Those of us who have worked in the various communications areas in corporations have seen tools come and go, and we have used them, abused them and disused them. That likely will continue with social media. At the end of the day, it won’t be those who talk about little else than social media who find the right uses in business for the tools; it will be those who try, fail and try again in a business setting to find the right strategies and goals for the proper use of the tools. And the goal won’t be conversation. What it will be is yet to be determined. Start small, perhaps with a blog. Don’t create a department for social media. No business needs another layer. Like all tactics, integrate social media into the plan of the departments in which the tactics will be used. Those departments likely will be marketing, communications (internal & external), retail, customer call center, etc. Establish measurable goals, strategies to achieve those goals and measure, measure, measure. Don’t listen to anyone who says social media can’t be measured for results. It can be. Lewis: Inbound marketing and communications are the places to enhance conversations and build relationships with our best customers. When used with analytical and predictive software to listen and gather information about customers wants, needs, likes and dislikes, social media can be another way to produce wonderful customer experiences. Comments? Reactions? If the goal of social media isn't conversation, what do you think it will be? How are you using social media to produce wonderful customer experiences? Will you be attending Surfaces 2009, which takes place February 3 through 5, 2009 in Las Vegas? If yes, consider participating in the educational sessions which focus on the future of floor covering. In fact, I'd love for you to attend my retail experience seminar titled "Your Customer's Experience: How Much Is It Costing You?" It takes place Wednesday, February 4 from 4pm to 5:30pm in the Sands Convention Center. I guarantee that you will bring something actionable back home from the session. Despite the economic environment - actually, because of it - your customer's retail experience matters now more than ever. If you don't believe me, step back and observe yourself as consumer. You may not be purchasing right now, but you most certainly are considering and researching and making decisions. I bet your decisions are 'negative' decisions. In other words, you are scratching resources off your list. You are narrowing the choices of those you will patronize and doing so based on the ease of your interactions and the overall quality of your experience. Andy Sernovitz, in Word of Mouth Marketing: How Smart Companies Get People Talking , says that You [i.e., your brand, your store, your service] are the User Experience. Paco Underhill says "amenability and profitability are inextricably linked." I see the two statements as totally relevant to today's retail experience. Think about it. How convenient and enjoyable you are affects the experience your customers have interacting with you. You are the user experience. Your user experience affects your profitability and the success of your business. In addition to looking at trends affecting the marketplace [for example, marketing to women, trading up and ageless marketing], we'll examine the retail experience and how to improve it [think Paco Underhill type observations], and review examples of retailers doing it right - including flooring retailers! What I'm particularly excited about is that I'll be weaving social media into the discussion. After all, social media allows you to extend the customer's experience beyond the physical store as well as engage the community and offer added value. It allows your traditional marketing tools to work that much more efficiently. If you have successful examples you'd like to share, I would be delighted to highlight them during the presentation as well as include them here in a followup post. Also, don't forget to attend the Flooring Industry Wake-Up Call panel discussion general sessions on February 3rd. Touch matters in retail. I have proof. Proof that engaging your customers in your retail experience, getting them to physically interact with the sensuousness of your products, will lead to sales. I found the proof in Retail Customer Experience which published an article titled Shoppers willing to pay more for products they can touch. The article is based on research from The Ohio State University and Illinois State University - published in the journal Judgment and Decision Making [see The Power of Touch]- examining "how touching an item before buying affects how much [consumers] are willing to pay for an item. A simple experiment with an inexpensive coffee mug revealed that in many cases, simply touching the coffee mug for a few seconds created an attachment that led people to pay more for the item." Touch something, hold it in your hands, feel its shape, weight, softness/smoothness, warmth/coldness, texture... Interact with it for 30 seconds or so and you will start to feel that that something is yours. Talk about ownership starting in the eyes, or rather the hands, of the beholder. Once that sense of ownership begins - in as little as 30 seconds - you'll willingly go to extremes to maintain your hold. The article describes the tests and the decisions that participants made in bidding for their mugs. "The results showed that people who held the item for 30 seconds bid significantly higher than people who touched the mug for 10 seconds. The average bid in the open auctions was $2.44 for people who touched the mug for 10 seconds and $3.91 for those in the 30 second experiments. This finding was also consistent for those in silent auctions, with people in the 10 and 30 second experiments bidding $2.24 and $3.07, respectively." All this for a generic mug - chosen on purpose by the researchers who wanted "the most minimal type of attachment" to test their theory. Physical contact affects how consumers value products. Certainly this proof substantiates the car dealership test drive, or the importance of trying on new clothes [ideally in attractive fitting rooms], shoes or jewelry. Or interacting with a puppy. But, what about the carpet or flooring buying experience? Couldn't we make it more about touch and feel? What about a flooring store where customers are invited to take their shoes off so they can feel the product with their feet as well as with their hands? Of course, that means selling beautiful products that exude feelings of goodness and comfort. Wouldn't that would make for an interesting retail experience! Next time you interact with something, let me know how you felt after holding it, and whether you bought it [or felt intensely like buying it]. This week's guest for Flooring The Consumer's Social Media Series: Bridging New & Old is Amber Naslund. Amber Naslund has a knack for getting right to the heart of what matters to brands, businesses and communities. If you don't believe me, take a walk through Altitude Branding which is all about "practical strategies for brand elevation through social media." You'll be touched by her passion for social media as enabler for greater things. Not pie-in-the-sky things. Rather, practical, common-sensical marketing things that truly add value, connect brands with customers and form communities. Definitely download her Getting a Foothold in Social Media e-book. I first 'met' Amber while exploring Plurk where she and other leading edge marketers actively engaged in meaningful discussion about social media effectiveness [e.g., July 2008 Plurkshop summary]. What a way to experience the possibilities of this platform! Her passion and humor were infectious. I felt an immediate connection. Given that knack, it's no surprise that Amber has just become Director of Community for Radian6, the social media monitoring platform for marketing, communications and customer support professionals. I'm looking forward to all that she will have to teach us about integrating on and offline communications for brand and community building. 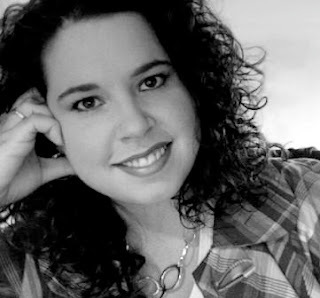 Look for Amber on Twitter @AmberCadabra, on her personal blog, Innacurate Reality, and MarketingProfs' MPDailyFix. C.B. : Amber, how/why did you get involved in social media? Amber: Well, I suppose you could say I’ve been “involved” in social media since the days of BBS, chat rooms, and the early days of online journaling. I’ve probably had a half dozen blogs over the years, though none of them were really business-focused until now. I started my career as a non-profit fundraiser, and from the very start I was involved with online volunteer communities, online fundraising, and how to leverage the web for things like cause-related marketing. The why is a little different. My career wound me through marketing and fundraising roles, but I was never a formally trained marketing person (I was a music major in college). And in the non-profit world, the development staff are often marketing and fundraising all wound into one. The fundraising world puts relationships front and center to success, so I always looked at marketing as a way to educate and inform people about a business (not directly sell to them). Social media – when it was eventually dubbed such – was really the perfect fit with my philosophies overall about when and how marketing works best. And the fact that it’s largely focused online reflects the rapidly evolving need for businesses to have a brand presence that’s both analog and digital. I love the potential for businesses to put their customer relationships back at the forefront of their business. When it works well, it encourages individuals and companies alike to more carefully consider how and why they’re communicating with people. Instead of putting the sales transaction first, it asks businesses to be more human in the way they approach their work. I love watching brands develop organically because people are connecting with the people behind the logo, building networks. That’s amazingly cool to watch. C.B. What do you like least about social media? The near-religious fanaticism that seems to be taking over in some circles. Social media is a set of tools and strategies that have a great deal of potential. But they are not a silver bullet, nor a one-size-fits-all approach that will work for every company. We need to be approaching social media with the same critical eye as we would any other business endeavor and understand how it’s going to impact the larger operation. I get easily frustrated when social media advocates are putting these strategies and the associated “rules” forward as a set of absolutes. Successful social media within a business is going to be based on the unique challenges and opportunities for that company, and while there are guiding principles that I think are sound, the “evangelists” can get a bit carried away with preaching vs. practical application. Consider what you already have and build on it. Not everything needs to be tossed out or reinvented. It can be incredibly effective to look at your existing communication vehicles – like your collateral or your e-newsletter – and approach them from a more social standpoint. Consider your company culture. I can’t stress enough how important it is for social media to be part of the culture, not just the operations of a company. Take the time to understand what obstacles you’ll face, what hesitations your management has about this, how familiar and comfortable your employees are with these tools. Social media can’t be siloed in the communications department. Know how your customers want to interact with you online. Don’t get a Facebook page because you think you should, get one because your customers spend time there and tell you that they’d look for you there. This requires doing the meticulous work of talking to your customers ahead of time – via phone, in person, through surveys, whatever. But build your presence based on their expectations, not yours. Be prepared for a commitment. Social media isn’t a campaign, it’s part of a holistic communication strategy. It takes time to get it right, and that means trying some things that won’t work, adjusting your approach, and moving forward over months, not weeks. The best part? Tweaking a blog strategy is a heck of a lot cheaper than running an ad that bombs or dropping a direct mail piece that’s got a 1% sort-of-return rate. Act on what you learn. If your blog comments are telling you that your customer service is lacking, do something about that. If your forum posts are asking for specific product enhancements, consider those in your planning. (If your product or service is lousy, the most brilliant social media work in the world can’t save you). Have a plan for how you’ll deal with both positive and negative feedback, and skip the canned corporate speak. If you aren’t using the connections you make through social media to better your business and move it forward, you’re wasting your time and effort. Tons, I’m sure. But suffice it to say that any social media strategy that will stand the test of time will be based on your individual business goals. No two approaches to social media will ever be alike, nor should they be. Make the investment in planning and outlining a social media blueprint that’s tailored just for you. Forging stronger customer and client relationships is incredibly rewarding, and ultimately, those relationships will translate into dollars. But take the time to plan properly so your social media strategy dovetails into the work you’re doing across the company. Integration is the name of the game. Thank you, Amber, and best of luck with your new Radian6 adventure! Comments? Reactions? What have you seen work well to forge stronger customer and client relationships? How do you integrate social media strategies with you other programs, including your offline programs? What did you find worked best? I'm sorry to say - I didn't make it into NYC to admire the holiday store windows as I promised in Retail Window Displays Matter. I tried, honestly, I did. There was a snowstorm one weekend; I visited my parents in DC another weekend; and then it became January and I got the OK on Saturday to go to Dallas on Monday for the week... And, now they're gone. But all's not lost thanks to the digital world. I have several visions with enlightened commentary to share courtesy of others more disciplined than I. Retail Customer Experience published this delicious article on 12/20/08: Photo gallery: The retail windows of Christmas 2008 which led me to David Pinter's 2008 PSFK NYC Holiday Store Window Survey and amazing Flickr 2008 NYC Holiday Windows Survey set. Feast your eyes on what David captured in approximately 100 photos! Did you know that About.com publishes a Christmas Windows Walking Tour Map? It's a 2 mile and 1.5 hour walking tour that mirrors most of my intended retail store windows tour. Here's where it gets even better. 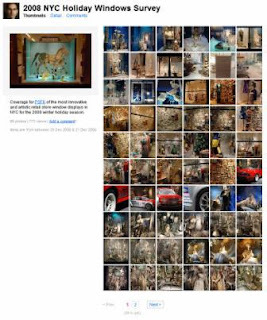 About.com also offers an historic perspective on NYC Holiday Store Windows. Can you imagine? Check out Holiday Windows at New York City Department Stores with details [including timing on when the windows are unveiled] on Macy's, Saks, Barneys, Bergdorf, Bloomingdale's and Lord & Taylor. Budget Travel's Exclusive: New York's holiday windows as festive as ever includes fascinating comments in reaction to the various NYC holiday window displays. They include a terrific slide show. Chic In Paris showcases some wonderful images of Bergdorf, Barneys and other 5th Avenue stores in New York Holiday Windows. + December 9, 2008: New York Holiday Windows, Lord & Taylor. To the tune of Vince Guaraldi's Christmas music, you can enjoy steveisaacs' New York Holiday Windows on YouTube which puts many of the images and descriptions above into context. By the way, the winners of DDI Magazine's 2008 eighth-annual Winning Windows competition are Bergdorf Goodman, Macy's Herald Square and Sony Style. You can read about Sony Style in Sony Style stores offer scent of the holidays; they put together a truly sensory experience including in their holiday window displays chocolate-inspired replicas of cameras and a gingerbread replica of the New York City skyline. Furthermore, the stores featured a holiday scent -- chocolate peppermint -- in their product displays. Wow! So, do you forgive me for not making it in person? Columbia Business School's BRITE conference is back for 2009! It's taking place this March 4 and 5 in New York City on the Columbia University Campus. Registration has begun with savings for early registrants. The best deal is available now through 1/26/09. And, I'm very pleased to be able to offer you a 15% discount off registration if you use the code above [briteblog09] when you register. The lineup of Featured speakers is impressive. 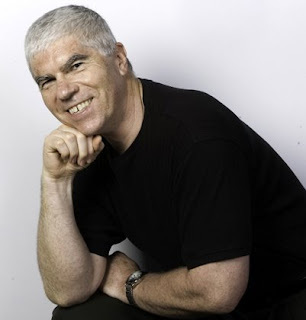 I'm looking forward to seeing Francois Gossieaux again [maybe I'll get to shake Seth Godin's hand!] and hearing Jeff Jarvis. Mplanet 2009: How Do You Connect With Empowered Consumers? Buzz is starting to build around Mplanet 2009, the American Marketing Associations's tri-annual conference taking place January 26 through 28 in Orlando, Florida. Josh Hallett at Hyku announces that Mplanet 2009 is Coming Up Soon and explores engagement and internal fragmentation in Engagement Isn't Always Easy. Scott Titus at Ideas, Ideas, Ideas discusses Brand U - Brand Building in a Digital World. 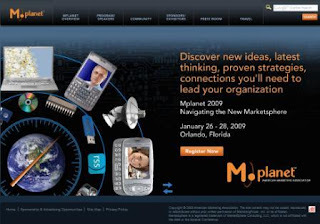 On the Marketing Message Blog, Stephanie Diamond asks What is MPlanet 2009 and the Digital Marketing Lab? She will be opening and closing the Digital Marketing Lab. And, at Hispanic MPR, Elena del Valle describes Making a case for relationship building to capture existing and emerging markets in today’s business environment. These and other marketers - like Toby Bloomberg, Peter Kim, Ann Handley and Becky Carroll - will be adding their perspectives to the Mplanet Conference and Mplanet blog. I regret that I can't attend the Mplanet Conference. However, I've been invited to contribute to the Mplanet blog where I anticipate spirited conversation taking place to figure out how best to - as the AMA says - 'navigate the new marketsphere.' I'm excited. Although all four themes interrelate, I'm most intrigued with the one that specifically relates to the consumer: connecting with empowered consumers. To me, that's where navigating the new marketsphere starts. Do you agree? David Meerman Scott advocates that we Lose Control of our Marketing to better connect with consumers who start the purchase process at a search engine. Losing control invites others to participate. Participating creates engagement which gives people a reason to talk to others and further immerse themselves in what you have to offer. His new e-book [titled Lose Control of Your Marketing] is another must-read. What are your thoughts around connecting with empowered consumers? I can't imagine a better way to start out the new year than with this week's guest for the Social Media Series: Bridging New & Old: Toby Bloomberg. Here's why. Any time spent with Toby will have you thinking differently about marketing, social media, your marketplace, connecting with customers... She does it in the most amazing way: through conversation, asking questions, listening for answers, and then building on that. She makes you feel as if you were entering into her living room for a cozy chat or discussion. What's so amazing about that? It's the same whether you visit with Toby virtually or in person. 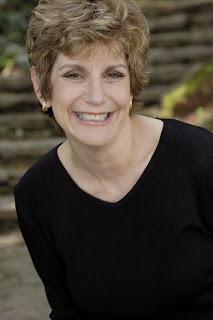 She is gracious beyond belief, an amazing listener, intuitive in her marketing and practical to boot! Not to mention really fun. Toby's constantly on the lookout for successful social media examples. You'll see those highlighted in Diva Marketing Blog posts, in her Blogger Stories, her Biz Blog Profile series [see Toby's right sidebar for companies included] and her amazing Blogger Relations Series. 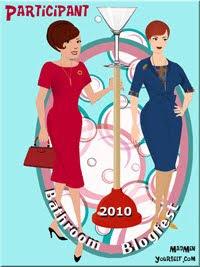 Her latest venture is DivaCafes on Facebook. It's "the cafe society for the digital age that celebrates and supports amazing woman over forty flying solo ~ and like minded people." It also captures Toby's love of community. Definitely check it out. C.B. : Toby, how/why did you get involved in social media? Toby: I wish I could tell you that I became involved with social media because I understood immediately that it would bridge the communication gap with customers in ways that extended beyond traditional advertising messaging. In bloggy transparency I launched Diva Marketing (blog) in 2004 because Dana VanDen Heuvel told me I couldn’t talk about blogs (we didn’t talk about “social media” then) if I wasn’t actively involved in the space. At the time I was advising small business owners to create blogs instead of spending thousands of dollars on a formal website. Not only could they develop a free web presence but by the way this cool “comment thing” allowed customers to talk to them also. Toby: Initially it was the ease of creating web pages without knowing how to code. As I began to explore the blogosphere I quickly realized what I was writing were not simply static pages but the openings to conversations that would lead to valuable relationships. Those digital relationships, ours included (! ), brought extended knowledge, a global network, business opportunities, speaking engagements and more. What was unexpected and surprised me were that many of the associations I developed turned into true friendships. Toby: My least favorite aspect is that many marketers consider social media a hip, new play toy and not a serious business strategy. Including social media without a strategy that includes goals and success measures dilutes the effectiveness, as well as, the credibility. Management then has every right to perceive, what should be powerful communication tactics, as cocktail party games. 1. Begin with a plan that includes goals and success measures. Don’t be afraid to include success measures that are outside the box of traditional metrics. As you build that plan consider how you can use social media to support current old media/traditional strategies. For example can you extend an article in an eZine with a blog post to carry on the conversation in greater detail? 2. Develop a budget that includes dollar and people resources. Build your programs to take into consideration human capital to support the implementation. If you don’t, not only will you be frustrated, but you will fail before you hit the publish key. 3. Understand the limitations and the benefits of the tools, or tactics, before you consider implementing. Listen and watch the rhythms of the social elements (blogs, vlogs, social networks, Twitter, etc.) you are considering before you create your social media strategy. 4. Determine if your target audience is involved in that specific platform. Then if they are listen to their conversations within each of the new media avenues that you want to explore. How are your customers using the platforms? The best Facebook strategy will fall flat if your community is not involved. 5. Bring all the people who will be involved in the project around a table for a strategic “red flag” conversation. The up front investment will save you dollars, time and tears. C.B. : Toby, any other thoughts to share about the effectiveness of social media in forging stronger relations with customers? Toby: By its nature, social media is changing the way business, internally and externally, is conducted. Listening to the on-going, multi faceted conversations of our customers demands now that we explore new ways to bring that information to employees who can provide solutions. Frequently that entails developing new communication processes that cross silos. While there may indeed be some turf challenges there are great benefits including building stronger teams. As critical to “listening” to our customers is responding back. Interacting with our customers in a public community where the conversations are overheard by thousands is becoming expected. Organizations who do not respond will be perceived as uncaring, not innovative, and may loose competitive advantages. Many organizations have “trust” concerns regarding how employees will answer blog posts, tweets or social networking discussions. Response by committee is no longer an option. However, great companies are built with people who share common goals and values. If employees’ values are aligned with the big organization’s high level objectives and the over riding goal is to serve the customer I believe we may find that social media is a catalyst to building more great organizations. Comments? Reactions? What about having to working across silos? Any suggestions on how to facilitate such a process? What has listening to your customers in these new ways brought to your business? What about responding back? Is it as scary as many think? Here is The Carpetology Blog Roundup for December, 2008! In case you missed our intense Holiday Spirit, you have until January 15th to enjoy Women of Wear-Dated: Disco Elfing, Elf Yourself Country, Women of Wear-Dated: Charleston Elfing! and Women of Wear-Dated: Classic Elfing. Then, there's also A Foot's Perspective #19: The Night Before Christmas. And, we could never let a month go by without offering carpet design inspiration. Check out Design Reviews From the Floor Up ~ Design With Christine, -no, that's not me- Create A Color Palette To Coordinate Walls, Carpet, Furniture & More, A Foot's Perspective - Episode 18: Fabrica's Silk Weave [with Fabrica's Robbie Schuette] and Mannington Commercial Carpet Design Competition - tx:style - which is still open for entries. Thank you for reading. Have a wonderful January and 2009!